﻿ Help - WorldSources.com, WorldOffices.com, iTrader ERP system, China Suppliers Directory, Global Buyers Platform, supplier, buyer, sourcing, trade, trading, manufacturer, product, producer, e-commerce. 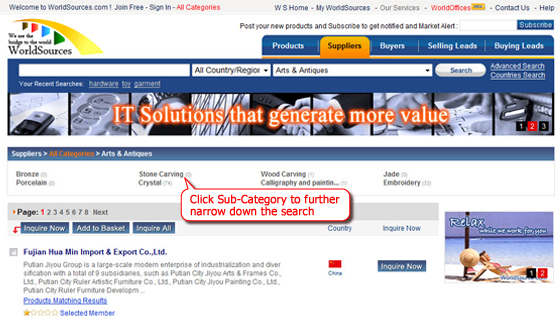 To browse: Users can select “Product” and then enter the name or keyword of the product you are looking for. Users can also search for suppliers, buyers, selling or buying leads by enter name and keyword in the box. Users can Browse by Category to narrow down the search. Users can click sub-category to further narrow down the search.